If the graphics of cupcakes sprinkled with Bingo balls and slices of cake topped with robust red cherries aren’t enough to entice you to Scrummy Bingo, perhaps the palette of unique Bingo games will be. At Scrummy Bingo you can have a go on loads of exciting games as well as trying out the latest promotional offers. Then again, maybe you’d be more enthralled with the numerous promotions that this site employs. Regardless of what brings you to play, the deliciousness of Bingo is delivered to you on a bright, colourful plate, ready for consumption. Continue reading our Scrummy bingo review below to learn more about the brand and what they have to offer. Bingo players of all persuasions are sure to find something on this site to relish. There are a variety of Bingo games to choose from, as well as scratch ticket games, casino rounds, best online slots and tournaments. It’s easy to shift from one game to another, allowing players to ditch one room if the atmosphere or speed isn’t to their liking. It’s merely a matter of closing the pop-up window and clicking on another. When playing Bingo, you can simultaneously open the slots so that you stay connected with the chat and game play in one area while trying your hand at something different. The current Scrummy Bingo bonus codes give you the opportunity to get an extra £30 to play with when you make your first £10 deposit. This is great as it gives you £40 in total to use across the site on different games. You’ll also get up to £3000 in free bingo in your first week which is perfect as you can try out all the features without spending too much of your own money on making deposits. Have a look at our Snappy Bingo review as well to see another brand with similar promotions that we would recommend. Since launching in early 2012, the site has been designed to keep players loyal. As you make deposits, you climb a loyalty ladder that offers you rewards. Each level increase, including Silver, Gold, VIP and SVIP, provides greater rewards, leading up to a 250% return on all your deposits. Earn free bets by signing in to your Facebook and Twitter accounts. Give Scrummy Bingo a ‘like’ and a follow, login to your Scrummy account to let them know, and they’ll credit your account. There are numerous promotions offered through online chat games as well. Take part in these to earn cash money and coupon codes. With as many colours and graphics bouncing about, it may seem like the site would be too convoluted to play. Thankfully, that’s not the case. With a Scrummy Bingo login, it is easy to navigate and pretty intuitive for even the most novice players. Scrummy bingo uses Cozy Games software and is on the live bingo network. Other sites on the live bingo network include; Swanky, ready set bingo, Aunty Acid, Fun and Viking Winners Bingo. There are ‘join now’ buttons strewn about the website, so finding a way to register is a cinch. The process for creating a new player profile is really quick. After completing a one-page questionnaire, with questions ranging in difficulty from ‘What is your address?” to “What is your name?” the program sends an email verification. Make sure you’ve entered a legit way for them to complete this step (I’m speaking to all of you with ghost accounts here). To claim your free £15 no deposit bonus, you must follow the link sent in the validation email. Once you’ve done so, you’ll be directed back to the Scrummy web page so that you can play different games. At Scrummy Bingo, the minimum deposit is £10 and the maximum is £500. To make a deposit, click on a tab labelled ‘banking’. From the list of options, you’ll need to click on ‘make a deposit’. A new screen pops up where you can enter how much you wish to deposit and then select your payment method from a drop-down list. Only one withdrawal is allowed every seven days. Depending on how you want to be paid out, the amount of time the withdrawal takes varies. Each transaction must be at least £30. Before withdrawing any money, you will need to have deposited at least £10 and made a minimum of one wager. Savor any of their mouth-watering games while you’re on the go. Access all of the same games and promos that are happening online with your mobile device. Whether your snack attack involves an iPhone, BlackBerry or Android, they’ve got you covered. The best part is that the mobile version is nearly identical to the PC one. 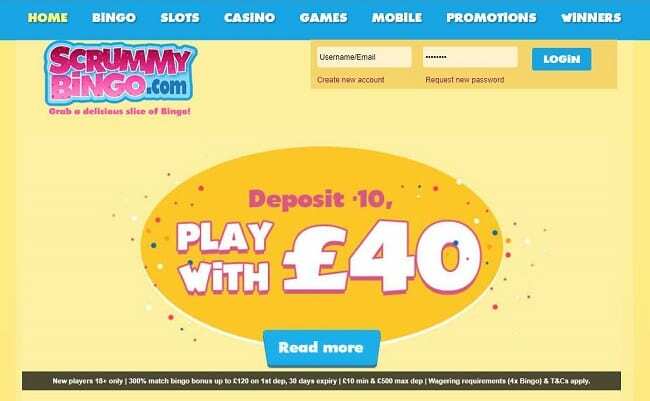 After completing our Scrummy Bingo review, we feel that this site is definitely worth trying out if you’d like to collect the latest welcome bonuses. The offers available here are really good for new players, and they have ongoing promotions too so you can continue to enjoy them.